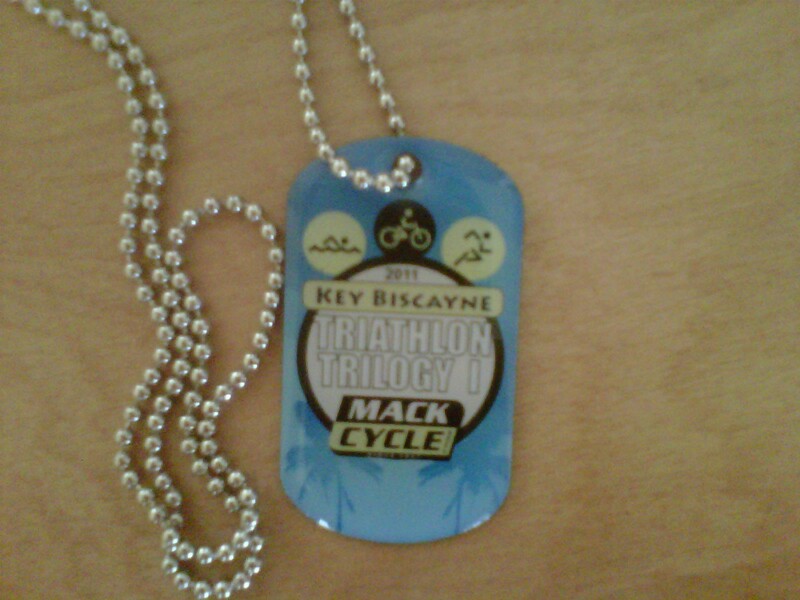 On April 1st I will take part on this years Nautica South Beach Triathlon. I will be doing a half-mile ocean swim, a 19-mile bike course, and a 4-mile out-and-back run course. Last year I did the shorter distance of this same triathlon and it was a lot of fun. I’m definitely looking forward to this race. This year I opted to also take part in a small challenge in this race. I signed up as a St. Jude’s Children Hospital hero. This means I made the commitment to help raise funds for this cause. Please Please visit my page and make a donation. All funds go directly to St. Jude Children’s Research Hospital to find cures and save the lives of children fighting cancer and other deadly diseases. Go here if you want more info on this race. Tri season is finally over! As I sit here with ice packs, compression socks and recovery shoes I have an immense feeling of accomplishment and relief. Miami Man was a success in my book and the season is finally over! I’m happy to report that I beat my expected time with flying colors. Because I had never done this distance before (my longest so far) I could not be exact in predicting how long I was going to take. I figured it would be any where from 3 hours to 3 hours and a half. Well to my surprise I finished in 02:56:31.32 and I was thrilled. The beginning of the swim was tough for me. As I started to swim I quickly became out of breath and heart was beating out of control. Because this had happened to me while training with the full wet suit I knew what was going on so I did not panic. I turned on my back and to a few strokes while catching my breath until I could continue. Once I felt better and warmed up I turned again and off I went. I never stopped swimming until it was time to stand up and get out. I looked at my watch and was a minute off of what I wanted to complete the swim in but I was content with my effort and continued the race. For the bike portion all I can say was windy, windy, windy!!! Wow that was tough! I had recently done a special size fitting for my bike and did not ride longer than 16 miles before the race so I knew this could be interesting. My legs felt great in this new position. I was so amazed at the difference. My back was not too happy. At about mile 12 I started to feel lower back pain and I got pretty uncomfortable. My lower left side was hurting me the entire time after that. I just kept pushing my self and thinking “the slower you pedal the more time you will be on this thing, and I want to get off so move it!! !” Literally kept repeating that to myself. Never been happier (well maybe when I rode 56 miles) to get off that bike. I started my run and I could still feel my back but it slowly started to go away. And of course something else started hurting. My stomach started cramping up. Not too bad, but the discomfort was there. I never stopped running. I only stopped at the water stations and walked so I could drink some water. I realized that I can not run and drink water at the same time! Over all my run was good. Cramping came and went all the way. I looked down at my watch and noticed I had the chance to make it under the 3 hours so I went for it. Pushed through, didn’t even look at any animals in the zoo. I was focused. Very happy I did it! When finished I was very pleased. When you know you give it your all and fight through pain and mental hurdles the feeling of accomplishment is even greater. Thanks to everyone that came out to support me and for all the messages I received. It really does make a difference when you have friends and family supporting me! I’m excited the day is almost here. On sunday I will take part in the International distance of the Miami Man (.6 Swim, 22 Bike, 6.6 Run). This morning I had my last workout with the JungleFit family and tomorrow is a rest day and bike drop off. Will go to the site and get my race packet, body marking and drop off my bike. I’m looking forward to finishing the tri season with a good race, fingers crossed! Last Sunday I participated in Trilogy II triathlon. The same Mack Cycle series that began last month. This was an interesting race for me. I was excited to race without being sick like last time. So I was looking forward to trying to better my time. Race day began smoothly, I was feeling good… Not nervous but just a bit sleepy. The entire week I had been getting up between 4:20 am and 5:30 am to workout in the morning before work and do it all over in the afternoons as I usually do. For the swim this time I was mentally preparing myself to jump in the water and immediately put my head down and begin swimming. This has been a challenge for me because I tend to wait around till everyone positions themselves to really start my swim. So when we were ready to take off I positioned myself in the middle of the pack off to the right. So I would not have anyone to the right of me just in case things got ugly. As I began to swim, I kept my self focused trying to find a rhythm. When passing one of the lifeguards on his surf board I could hear him yelling “let’s go, this is what you train for”. Immediately that gave me the push I need it. In my head I was telling myself all kinds of crazy talk to keep going. I was swimming behind two girls that were a bit further up. I said to myself, you have to catch up. I began pushing myself trying to keep form as much as possible (thinking of my coach yelling at me for not rotating). Just before it was time to stand up I noticed I had the girl next to me! I was so happy that I was able to push and keep focused to meet my goal. When racing its all about short-term goals for me. Pass this person and then sight another one and pass them and so forth… I’m happy to report I swam this race 2 minutes faster than last month’s race. I came in at 10:03 minutes. Yeah!! The bike portions started a bit rocky. I had practiced so I was looking forward to also doing a little better this time. As I began to put my bike shoes on I realized that the inside strap had come loose. I thought not to mess with it and just wear the shoe as is. I get my bike and run out of transition area. When trying to mount on the bike I look down and my chain had come off. I tried to mess with it, but not knowing what the hell I’m doing I start to panic. Thank god some stranger that was cheering for us came to my rescue. He helped me and put the chain back on. I got on my bike and off I went. I tried not to let it get to me as I knew that had cost me a few minutes of my time. After all I came in 4 seconds faster than the previous race. So now I’m curious to know what my time would have been if I didn’t have the chain issue. Bike time 36:35 minutes. I need lots of improvement on the bike. It is my weakest point. The run went smooth. Surprisingly enough it was not too hot and mostly shady. Didn’t go all out but a comfortable pace and finished at 28:19 minutes for 3.1 miles. Now this time around my transition times were longer. I will be practicing for next event. Overall, I’m very happy with this race as I finished in 1:17:55 and that’s 2 minutes faster than last month’s Trilogy! Gotta keep working hard, but I am seeing improvements and that’s what keeps me going. Yesterday I completed the first sprint Trilogy triathlon of the season. It was definitely an interesting race for me and this phrase came to mind as I was racing. “The more difficult the challenge, the greater the reward”. Why that is, because this was my first race I have done while sick. Last thursday night I started to feel a scratchy throat. By friday it was a severe sore throat. As stubborn as I am, I still went to swim practice and by the fifth lap I just had to get out and go home. Breathing through the mouth while having a sore throat was not a pleasant thing. By saturday my sore throat was gone but all the congestion started. I woke up early and went to boot camp class as it was in South Beach (my favorite) and I did not want to miss it. I did taper back some in class so I wouldn’t be sore the next morning for the race. Never the less, it was an intense 2 hour plus workout. Sunday morning arrives. I had been looking forward to the race as I participated in it last year and was eager to see if I could improve my time. On this morning my congestion was pretty bad and I was coughing a lot. I was not able to have my breakfast as I did not have an appetite. I made sure I was well hydrated and had plenty of fluids. Off to the race I went. I was calm and planned to stay that way. I did not want to get nervous about racing with this cold. All I kept thinking was, “just do your best and DON’T DROWN!!!!”. It was tough for me to get my rhythm going in the swim but once I got it, I was good to go. The bike part needs great improvements. Out of the three disciplines is the one I practice the least. My run was ok, I felt good while running. But I made sure I had my rag because I was blowing my nose and coughing the entire way. Overall, I had fun. I do these events because I enjoy being active, meeting new people and sharing one more interest/hobby with my husband. 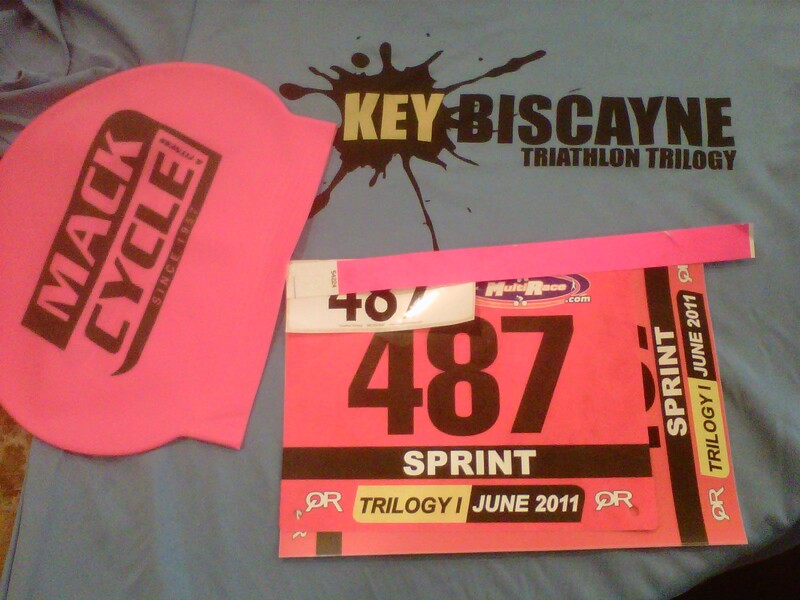 This Sunday I will be participating in the first triathlon of the Trilogy series. This will be a sprint tri which includes 1/4 mile swim, 10 mile bike and 3.1 mile run. I’m looking forward to this event and hope to do better than last year as it was my very first triathlon. Will keep you guys posted on results.